The International Space Station recedes in this image taken from a Russian Soyuz spacecraft carrying three astronauts home to Earth on May 13, 2013. The commander of the International Space Station and two of his crewmates are headed home tonight (May 13) aboard a Russian Soyuz spacecraft, bringing their five-month orbital adventure close to its big finale: a safe landing on Earth. A Soyuz carrying Canadian commander Chris Hadfield, NASA astronaut Tom Marshburn and Russian cosmonaut Roman Romanenko undocked from the space station at 7:08 p.m. EDT (2308 GMT), setting the stage for the crew's return to Earth. 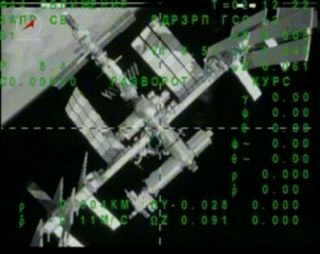 Today's undocking marked the official end of the space station's Expedition 35, which Hadfield commanded. Russian Pavel Vinogradov takes over the new Expedition 36, leading fellow cosmonaut Alexander Misurkin and NASA astronaut Chris Cassidy for the remainder of the msision, which ends in September. "Enormous thanks to everybody on Earth that makes this possible," Hadfield said during a change-of-command ceremony Sunday (May 12). "It's been a very special time for us onboard." Three more spaceflyers are slated to arrive in about two weeks, bringing the orbiting complex back up to its full complement of six crewmembers. Marshburn is coming home just two days after performing a dramatic emergency spacewalk on Saturday (May 11) with Cassidy to find and fix a leak of ammonia coolant, which crewmembers first spotted just two days earlier. The two astronauts replaced a pump control box during the six-hour excursion, apparently stopping the leak, though NASA officials cautioned that time will tell if the fix is permanent. Hadfield said the execution of that spacewalk — which went from conception to reality faster than any other excursion from the space station — filled him with pride in his crew and the many people aiding operations from the ground. "The real-time execution of that was what just felt so good to me as commander of this crew," he said during Sunday's ceremony. "For me, this was just the personification of what the International Space Station is, and what the people mean to it." Hadfield took pains to share his spaceflight experience with people around the world. He posted updates and observations frequently on Twitter, recorded songs and videos aboard the orbiting lab (including David Bowie's famous "Space Oddity") and beamed home many photos of our planet from his perch hundreds of miles above it.